I’m not a fan of 3D at all. 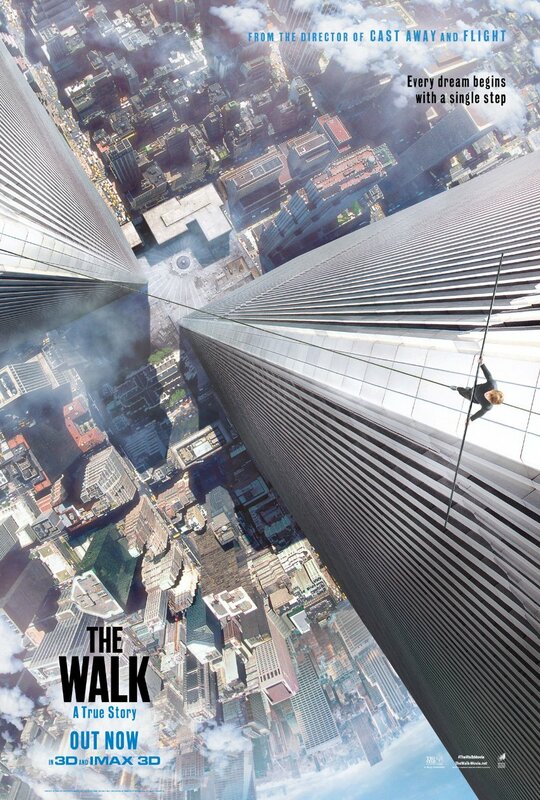 And I was keen to avoid the sensation of vertigo that some audiences have experienced whilst watching Robert Zemeckis’ latest film The Walk in 3D. To add extra drama to my session I watched this film in IMAX and I have to say the results astonished me. Joseph Gordon-Levitt stars as Philippe Petit, the French tightrope walker featured in the 2008 Academy Award winning film Man on Wire, which documented Petit’s feat in August 1974, when he attached his wire between the tops of New York’s Twin Towers and performed for 45 minutes, making eight passes along the wire, during which he walked, danced, lay down on the wire, and saluted watchers from a kneeling position. The Walk kicks off with JGL as a young Petit atop the Statue of Liberty narrating his early efforts to survive as a street performer, after becoming enchanted by the spectacle of circus performers as a child. He enlists the help of Papa Rudy (Ben Kingsley), the boss of the circus high wire act, and is trained in the fundamentals of the art of wire walking. After initial attempts by the director to use the real Petit, with a younger actors face superimposed over his with CGI, JGL was given the task of mastering the basics of tightrope waling (and some French), and he comes across as having a natural ability, both as an aerial artiste, and a frog. JGL makes for a charming Petit, and it’s not long before we are swept up in his plans to walk between the towers, and it’s here that the film becomes more of a heist style of caper movie, complete with a supporting cast who enable Petit to fulfill his dream. When we finally arrive on the rooftop ready for his big moment, the cinematography comes to life in the most incredibly vivid way, and the IMAX 3D experience enhances this to its fullest capacity. I was in awe of the grandeur of Petit’s actions and of the way Zemeckis captures the physical, spiritual, mental side of the event. Literally this is gob-smacking stuff. See it on the biggest screen you can and pop on those glasses for the most stunning pictures you’ve ever seen. 4 Stars.